June 29, 2017 – Legoland Japan!! This morning The Penpal, Tiny Dog, and I checked out of our hotel and set off for Legoland Japan. We boarded Aonami line from near our hotel on a train packed with salarymen. The journey to Legoland took us through some of the extensive port areas in Nagoya, passing by rows and rows of new cars ready to be loaded onto a boat for overseas shipping. After 25 minutes of ports and industry, we arrived at Kinjofuto station, located on a small island which is home to a conference center, restaurants, railway museum, and most importantly, Legoland. A live Ninjago puppet show! The one thing that Legoland didn’t have was protection from the insane humidity. By the end of our Lego day we were tired and drenched in sweat. TD managed to fall asleep on the train and not even the noise and activity of Nagoya station, one of the busiest stations in the WORLD could wake him up. I’m already excited about our next trip to Japan and a return to Legoland. Today I went to Aichi Expo with The Penpal and her parents. Expo is a world fair, with pavilions from 121 different countries, and also some large corporate pavilions as well. The Penpal’s parents booked us a tour package that included bus transportation to and from Expo and a full day pass. The Expo grounds are 230km from Numazu, and we had to make a few stops along the way. That meant that the bus left from the north side of Numazu station at 3:55am. I woke up at 3:00, had a quick shower, and The Penpal and her family came by in a taxi to get us all to the station on time. Most people slept on the bus, but sleeping on the bus is nowhere near as restful as sleeping in a comfy, comfy bed. 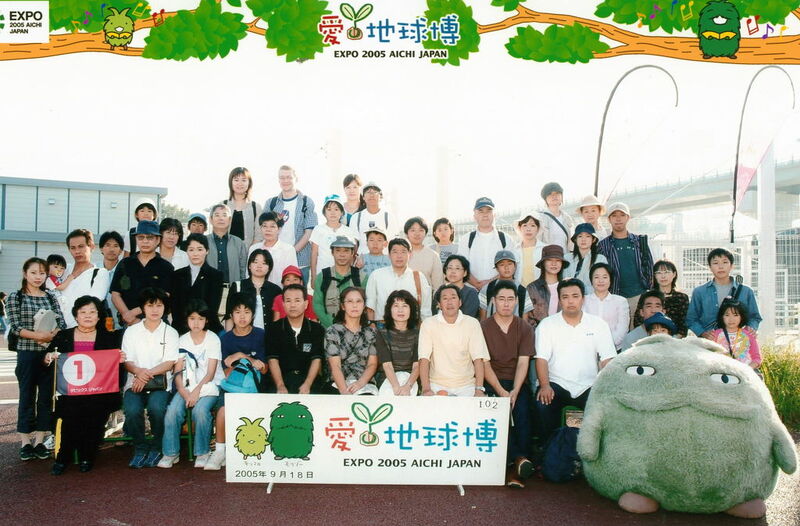 We got to Expo just after 8:00, and got a group picture after everyone got off the bus. The result is above, and the only two people smiling are The Penpal and I (back row, I am the only non Japanese person). After the grumpiest group photo ever, we all rushed towards the entrance to wait for the gates to open. It was already hot, and the crowds were intense. Fortunately Japanese people are good with lines, so the massive crowd of people was orderly and polite. We spent a full day at Expo, walking around in the heat, waiting in various lines to see different pavilions. We ended up going to Canada, USA, Mexico, Turkey, and a few others. The corporate pavilions had waiting times between 4-8 hours each. As much as we wanted to see the awesome robots that can play the trumpet, we had no interest in standing in line for that long to see just one display. The Canadian pavilion featured interactive displays about the country, which The Penpal’s parents found interesting. 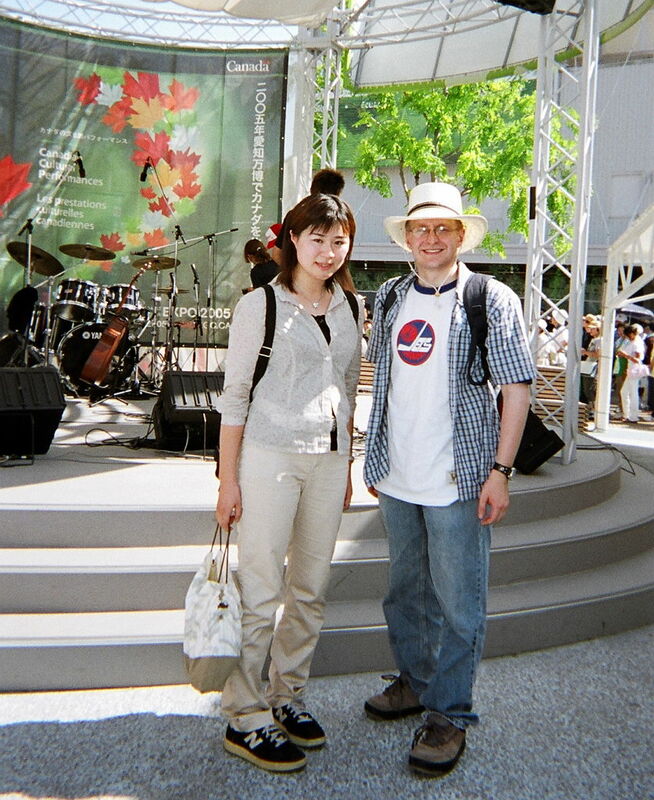 As a rule, Japanese people know well about the US, but not nearly as much about Canada. One of my highlights was seeing a live performance by a band called Blou. They play Acadian party music, and managed to get the entire crowd up and dancing in 35 degree heat. There were a lot more things to see, but with the crowds and the heat, we really took it easy and limited ourselves. Also, you can only go to so many things when there is a 45 minute wait for the women’s washroom! We nicknamed the women’s washroom “toilet pavilion” because it had the same kind of line as many of the countries. After a long, hot, crazy, crowded day, we all got back on the bus in the evening and got back to Numazu station before midnight. I am happy that I got to spend the day with The Penpal and her parents, but if I was going to do something like this again, I would break it into two days and stay in a hotel. (2015 Update) I wanted to find out if Expo was really as busy as I remembered it. It turns out that the attendance on September 18, 2005 was 280,000 people. The official capacity was 170,000. No wonder the lines were so long! Japanese buses are f**king confusing! When people think of mass transit in Japan they usually think of trains first, and for good reason. Trains are by far the most famous and most efficient way to get around the country and the major cities. But not all cities are big enough to have great train systems like Tokyo or Yokohama. Enter the bus. After living in Winnipeg, I am very used to riding the bus. Winnipeg Transit is usually on time, and provides decent service along major routes and is really cheap. Before anyone in Winnipeg starts complaining about this one, I would suggest that you try another city’s bus system first. Anyway, I figured that since I mastered the train system with no previous exposure to trains, buses would be no problem. Was I ever wrong! When you want to leave the bus you press the signal button and you insert your ticket in the reader at the front of the bus beside the driver. The readout displays how much you owe, and you insert that in change into the coin slot. If you have a 1000 yen bill you can put it into the bill slot. The bill slot will break your 1000 yen bill into 9 x 100 yen coins, 1 x 50 yen coin and 5 x 10 yen coins. You then insert the correct amount of change into the coin slot and leave the bus. Despite the fact that vending machines, train ticket machines, and EVERY OTHER MACHINE WHICH TAKES PAYMENT allows you to pay with bills, this bill slot only makes change for you. Last Friday I rode the bus from Mishima station near my school to Ooka station near the Penpal’s house. I didn’t have enough change, but I had a 1000 yen bill and NONE of the information I just typed. First I tried to stick my ticket into the bill slot. Fortunately the driver was able to rescue it and put it in the right place. The display read 270 yen, so I inserted my 1000 yen bill, took all the change (1000 yen) and tried to leave the bus. The driver stopped me, and then I realized that I hadn’t yet paid. Fortunately, most bus drivers are used to people (especially foreigners) being confused with this system and are very patient and friendly about the whole thing. 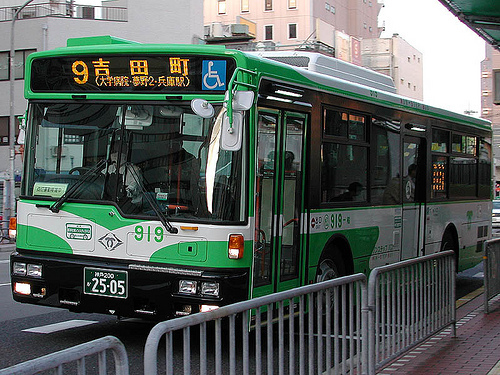 To make things even more confusing, in Nagoya city there are two companies that run buses in the city. One has the previously mentioned system of breaking your bill and then you pay. The new company accepts payment with bills and makes change. Two different systems in the same city. Even the Japanese are confused by that one. In the mean time, I think I will try to stick to the excellent train system where I can insert any bill and coins by the handful, or my bicycle that I can drive on the sidewalk and park nearly anywhere. buses are just too f**king confusing.